I recently started to pay attention to what's going on at crypto-markets and, being developer for a long time, decided to take a look at the software we have out there in public access. So I have a question to all crypto-guru here: As it seems from Bitcoin protocol specification, bitcoin will accept ANY nonce that satisfies target (block) bits condition. Every single miner I've seen made public is using sequential loop over nonce1 and nonce2. actual question: why do people implement +1 for the nonce in every thread, instead, let's say, having 2 thread one is going +1 from the beginning; second one is counting -1 from the end of nonces interval? In my humble opinion, it would be faster if you're running several threads on the same interval...or, in the perfect world, split the entire interval in N subintervals leaving every thread do its own piece. 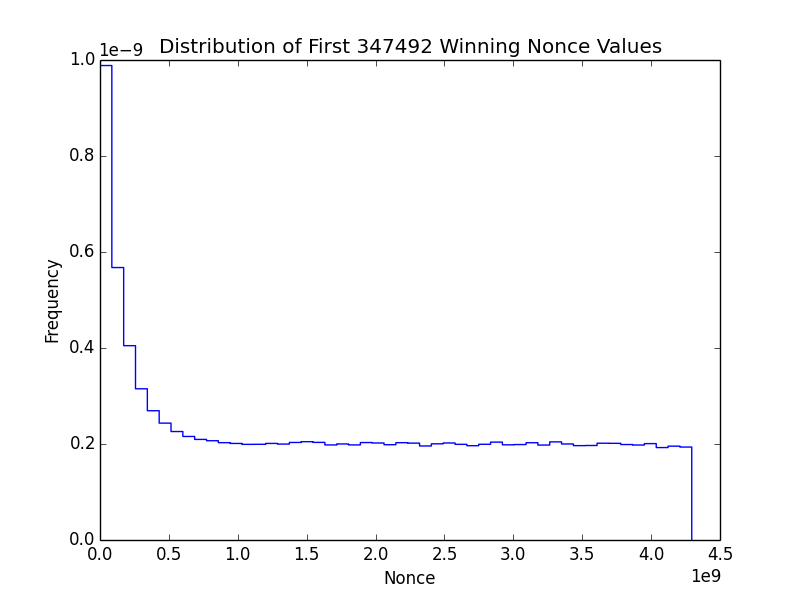 From the mathematical point of view it seems like we gonna get higher probability of hitting 'golden nonce' using this approach, as opposed to +1 over the entire interval. Am I wrong here? split uint32_t into 1024 identical intervals and see how many nonces from existing blockchain are sitting in every interval. results are the same: uniform distribution. again, why is it +1 in the miner loop? even though, (+3), (-2) would have yielded (in theory) better chances (faster) finding golden nonce vs others doing (+1). Thus, +1 in the miner loop is the simplest way of changing the nonce, and it works because the valid nonce distribution is uniform. ASICs often deal with nonces very differently. Also, ASICs can scan the entire nonce range very quickly, so it doesn't really matter where you start looking for a valid nonce. If you use four threads and split the range over the four threads, that means each thread finishes its range and starts a new one four times as often. That's clearly a losing proposition over giving each thread its own full range. Not the answer you're looking for? Browse other questions tagged bitcoind scrypt theory or ask your own question. Is it possible to monitor all crypto-coins? Is the a library for generating signatures and transactions for scrypt coins? If i have rpcuser and rpcpassword of a remote bitcoin server,can i transfer that server's bitcoin to other address?